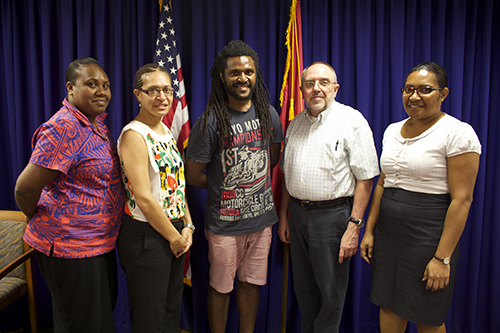 Kasek Galgal, a Physics tutor at the University of Papua New Guinea (UPNG) and band member of music group, Barefoot, departed Port Moresby on July 30 to represent Papua New Guinea at the Youth Excellence on Stage Academy ASEAN in Jakarta, Indonesia. He will participate in a two-week program alongside participants from the ten associations of Southeast Asian Nations (ASEAN) in the Hip Hop Lyricism, Performance and Music Production camp, as an observer nation representative. This program, supported by U.S. Embassy Port Moresby, is co-hosted by U.S. Embassy Jakarta, American Voices, and the Jakarta Institute of the Arts. Mr. Galgal, who was selected from a pool of strong applicants from Papua New Guinea, will be mentored by world-renowned artist and activist Fabian “Farbeon” Saucedo. Farbeon brings a community-based approach to the creative process that has inspired the young and old globally. His performance range includes the use of loop stations, effects pedals and live computer production. Farbeon also mentored Allan Aufamau, famously known as Sprigga Mek in Papua New Guinea. Allan was last year’s participant at the camp hosted in Bangkok, Thailand. The Youth Excellence on Stage (YES) Academy program serves as American Voices’ flagship cultural engagement program. The program was launched in 2007 to connect and inspire youth in areas of the world that lack opportunities for cultural exchange and dialogue with the United States. The YES Academy program provides high-quality professional training and performances in some of America’s great cultural genres, including Broadway, Jazz, Hip-Hop & Breakdance and Classical Orchestra to work to inspire and motivate youth artistically, and train future teachers and leaders.